Bird behaviour can sometimes surprise you when you least expect it. I had been birding on Goat Bluff, on the South Arm peninsula, on the eastern shore of the Derwent River, and decided to make the short journey to the South Arm neck, really hoping to get to grips with one of the Swamp Harriers which hunt over the marsh there, from time to time. The first thing I noted as I drove along the neck, was the flock of Oystercatchers, mostly Pied with a couple of Sooty, roosting within a metre of the road. Although the tide was in, this isn't the favoured roost site, and I surmised that they had been disturbed, but by what or whom? I drove on. I casually looked toward the stunted trees, growing on the windswept dune s to the South, half expecting to see a Harrier, the treetops being a vantage point they often use to survey the marsh. I did a double take! 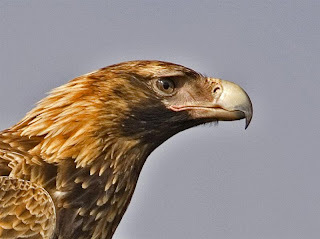 Instead of the expected Harrier, there was the unmistakable shape of a Wedge-tailed Eagle. Quickly doing a U turn, I pulled to the side of the road to watch and take a photograph, albeit from inside the car, as I felt sure it would fly off if I got out. Having secured a shot, (I've added the image to show it really was a free flying bird! ), I got a little bolder and moved the car closer. It lifted off and using the updraft from the dunes, hunted over the area. I watched, just enjoying the moment, as the eagle went about it's business, but a little disappointed in not getting a better shot. But all was not lost! It returned to the vantage point it had only recently left. Well, over the next 20 minutes or so, I got a little bolder in my approach. Eventually getting o uit of the car and walking up to the tree it was in--and it stayed there! The shots shown here were taken from the sort of distance an eagle or indeed any other bird, would almost certainly normally cause them to take flight. I walked back to my car with the eagle still atop the tree, mulling over why it had behaved so apparently indifferent to my presence. Perhaps it was driven by hunger, or is it a recently rehabilitated bird? I have seen, what I suspect is this bird, hunting over nearby woodland and on to Betsy Island, usually harried by local Forest Ravens. I doubt that I'll ever know the cause, but it's events like this, that make birding so pleasurable. 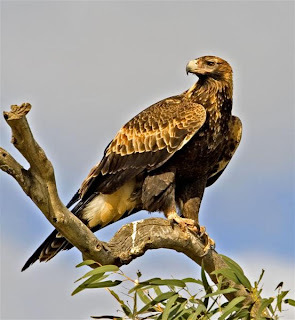 John Tongue writes: We have only recently moved to the North of the State (Ulverstone), and we are still exploring the best places, and the best birds. We are starting to come across a few little "jewels". We had been told about the Tasmanian Arboretum, at Euganana, near Devonport, and thought we'd go and check it out. It's a lovely place, which has the potential to become even better, as many of the trees planted are still only very young. In fact, it should become q uite a "jewel" in the natural assets of the State. 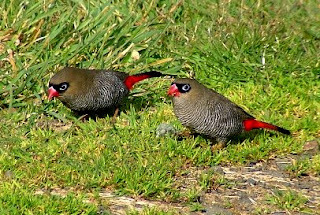 While we were admiring the plants, and doing some birdwatching, we came upon a very confiding pair of Beautiful Firetails (pictured). 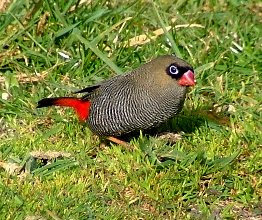 We don't often happen upon these wonderful little birds, and when we do, we have generally struck them as quite shy. Not this pair! With camera snapping away, they let me approach to within about 3 or 4 metres, as they fed nonchalantly along the edge of the track. They were a brilliant sight in the warm Spring sunshine. A jewel of a bird in a jewel of a place. Just before going overseas recently, I visited the Wielangta Forest. My main interest was in the extent of the damage caused by last Summer's fires. Certainly there are extensive areas that were burnt, mainly on the eastern side of the road as you enter from the South, but not as bad as I feared. Since returning from overseas, I've made 2 further visits, and on both I stopped off at the picnic huts at the southern end of the Sandspit River track. As usual, I made a 'bee' line for a clearing among the rainforest. I've found this to be a good spot for photographing some of the more elusive rainforest species. It's here that I've photographed Scrubtit and Tasmanian Scrubwren. It's not that these species regularly occur here, it just has more light to work with, and if you're patient, you might just be lucky. Well on the first trip, I patiently waited, and as nothing stirred, as I so often do on these occasions, my mind wandered off. I was abruptly brought back to the real world by a movement far to my right. A Bassian Thrush running along the fallen tree only a few feet in front of me! I hardly dare move for fear of scaring it off, and was torn between putting my camera up to my eye or not. As you can see by the upper image, I eventually managed a shot, and that's virtually the full frame. Shortly afterwards, it flew to the forest floor and raked around, before moving off. I'm sure they're not that uncommon here, but I've not seen one previously at this spot. A few days later I made another trip to The Wielangta Forest, and the self same clearing, hoping to get the chance to see the thrush again, and improve on the photos. That wasn't to be. After a moderate wait, in which I had a visit from a lone Scrubwren and a group of Tasmanian Thornbills, neither presenting a photo opportunity, and as I was about to leave, I caught a glimpse of a darkish bird in the nearby scrub. Expecting it to be the thrush, I was a little disappointed to see that it was an, as yet, unidentified Whistler--both Golden and Olive occur in the area. As you can see by the lower shot, it was an Olive Whistler. Most of the time, it preferred the dappled light among the scrub, as from my experience they often do. Fortunately, it finally, all too briefly, came out of the scrub, and the dappled light, and allowed a few shots. I've attempted to photograph 'Olives' on several occasions recently, but they're generally much shyer that 'Golden'. A search for images of Olive Whistlers on the internet, would suggest that they're photographed infrequently. I'm sure I shall be returning to this clearing! With rain forecast for the afternoon, I decided on a quick visit to the Peter Murrell reserve at Kingston on Monday morning. Well, to be truthful, the 'quick' part was forced on me by the rain arriving early! Before that, I wandered round the upper pond, just enjoying listening to, and identifying the many birds calling, including a number of our endemic species--Yellow Wattlebird, Black-headed and Yellow-throated Honeyeaters, and saw a few Native Hens scuttling off into the reed beds. I got rather less enjoyment out of the 'domestic' ducks that seem to have taken up residence there. I walked across the crest of the earth dam, noting that the 'resident' pair of Tawny Frogmouths were occupying the same nest site that they have for some years. It was here too, that I heard, then saw, several Black-faced Cuckoo-shrikes, apparently a favoured nesting site in recent years. I could hear, Pallid, Fantailed, Shining bronze and a solitary Horsfield's bronze, cuckoos, calling. I spent some time seeking out the Horsfield's, to no avail. On down the fire trail. I watched the local Masked Plovers on the nearby paddocks, rise and give battle with a passing Swamp Harrier, which regularly quarters the area. No sooner had it disappeared, than I could hear the unmistakable raucous call of a Brown Falcon. 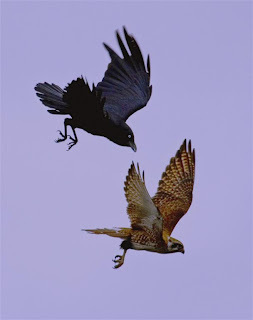 It flew at speed out of the woodland beyond the second dam, pursued by an equally vocal Forest Raven. Just time for a quick shot, before they both disappeared into the woods to the East. The accompanying shot, (unfortunately shot against a "hot" sky), was the only one I had time for. I think by the size comparison of the 2 birds, that the Brown Falcon is probably a male. I suspect that both of these birds are nesting in this area of woodland, and probably come to blows fairly often. Excitement over, and dark clouds gathering to the West, I only had time for a quick look for Forty-spotted Pardalotes a little farther down the trail. By chance I flushed one from the bank along the path, and further inspection suggested that it may be nesting in a hole in that bank. Any chance I might have had to watch the site was dashed by impending rain, and as I was carrying my new camera gear (yes I can't resist buying more gear) I was anxious to beat a quick retreat to the car. A worthwhile trip for all that and I thoroughly recommend a visit at the moment. At last I've managed to fight off the lethargy that seems to have dogged me of late, and I'm back blogging. As some of you know, I've been in the US for several weeks (NE Illinois), my fifth trip there. I usually look forward to seeing a range of interesting waders, yellowlegs, dowitchers, stilt sandpiper and sim ilar, but it wasn't to be this year. In the first 2 weeks it rained over 300mm, we had a tornado warning, and the county I was in, along with adjoining counties, were declared "state of emergency " areas. Nearly 5000 trees had to be cleared from roads, and much of the areas around the rivers were, as you might expect, flooded. Many people went days before the electricity supply was restored. Fortunately, where I was staying, with my son and his family, was not seriously affected. The dramatic warning, pictured, together with a 'siren' sounding, came up on all TV channels (there are several hundred channels!) coupled with a warning to take cover immediately. We also watched the storms approach on the weather radar in real time on the internet. In the event, the tornado was minor, but it was embedded in a serious storm front--which did most of the damage. The approaching storm got the adrenalin going and I must admit to wanting the tornado to come close enough to see, but not close enough to experience it first hand! I did still get to see a good range of both local and migrating birds--the western shore of Lake Michigan is a migrant bird flyway. The downside of all the standing water was the mosquitoes. I've never seen so many, (or been bitten by so many) some nearly the size of hummingbirds--I exaggerate (a little). With West Nile Virus widespread in the area, the local authorities undertake widespread spraying, from vehicles, of the urban areas. This disease (similar I believe to Ross River Virus, also spread by mosquitoes), has caused several deaths in the area, and has been blamed for the serious decline in the numbers of American Crows. Meanwhile, back in Tasmania--Spring breeding is well underway, and many of the migrants have already arrived. I've noted Woodswallows, Cuckoo-shrikes, martins and swallows, all the expected cuckoos (including Horsfield bronze at 3 different locales), and most of the migrant waders, so it's all happening out there. A tour of local birding sites showed that many birds have started breeding, with young Yellow-rumped and Brown Thornbills already on the wing. So I'll start reporting on the local scene soon.